This Monday GoL brings you parallel interviews with members of the core team for the free open-source game "Naev"
Quote Naev is a 2D space trading and combat game, taking inspiration from the Escape Velocity series, among others. You should be able to get the game from the default repositories, yet you can always download the latest version, as well as read the instructions, from their website. Also, this entire panel was done in their IRC channel which is where the team likes to hang out and discuss future plans. So feel free to visit after you're done reading and provide some feedback. I wish you all pleasant reading and don't forget - Enjoy! Let's start with a short introduction: Mind telling our readers something about yourselves, your developer background and your involvement with the project? bobbens: I am Edgar Simo-Serra, currently a PhD student working on computer vision and robotic problems in Barcelona, Spain. I am currently 25 years old and work on open source projects in my now diminishing free time. Naev was my first major project I started in solitary around 7 years back as an high school student with no real programming background. After a few years I decided to rewrite it all, from which the current Naev was born. Eventually I went online with version 0.3.0 to get more developers and the likes. As far as my role, I am currently the project leader of Naev. BTAxis: As for myself, my name is Bas Fournier, I'm just an average Dutch guy who lives in Sweden at the moment. My involvement in Naev started around the time my involvement with UFO: Alien Invasion was cooling, and I knew bobbens from his own contributions to that project. I decided to stick around in his IRC channel and contribute some writing, proposals and scripting. Apparently bobbens liked them well enough, because he offered to take me onto the core team. Deiz: I'm Sean Hildebrand, a Canadian who owns zero pieces of flannel clothing. I've been a gamer for most of my life, and have always had an affinity for any sort of Sci-Fi media. Ambrosia Software's Escape Velocity series was (unsurprisingly) one of my favourites, so when I discovered Naev back in late 2008, I more or less dove in head-first. Naev is my first "big" project. I've hacked on little personal scripts for years but it's been my introduction to more serious development. At present I fulfill a bunch of roles, essentially picking up the slack where we don't have someone specialized to the task. I tend to alternate between wrangling media (sounds, music, 2D graphics) and being a code janitor, mostly on the C side of things. So what can you tell us about this game? How did it all start and where's it going? bobbens: Well I used to be an avid player of Escape Velocity, which is an old Mac OS classic game as a kid. It was developed by Matt Burch of Ambrosia software.The game was like the glory of my childhood and as I started getting more involved in the open source world I noticed there was nothing like it. So I took the opportunity to try to create what was then thought as a clone of the original Escape Velocity. As time went on it has evolved into it's own project (I did a post about that a while back) and now it's rightfully it's own game. Currently the game is evolving towards being more complex but at the same time trying to keep the simple quick immersion the original Escape Velocity had. Basically trying to improve the mechanics to obtain a stable and interesting creation platform for which to thrive on. BTAxis: The game started before I came on board. Its origin is bobbens' personal decision to create an Escape Velocity clone. I know little of the start of that journey, but apparently the first ship the game ever had was a crudely drawn green arrow. Up until version 0.4.2, the game basically followed in EV's footsteps, emulating most of its gameplay and user interface. But then the game started making changes to that formula, the most visible example of that being the big systems that are now in place. Where EV's systems were basically planets with a bit of context around them, Naev's systems are large expanses populated by planets and, in the future, other things as well. Where the game is going is hard to tell, although there are a number of proposals on our wiki that might give you some hints. Certainly we know more or less what we want to do in the future, but we don't know where it will end. In a very real sense, we're making it up as we go along. Deiz: Naev's actual origins are shrouded in secrecy! Which is to say, bobbens developed the very early versions of Naev himself, and it only became a public project after a few years of on-and-off development. Where it's headed, though, is something more up my alley. Up to version 0.4.2 Naev essentially strove to re-implement the gameplay mechanics of the Escape Velocity series. In fact, back then we were still "NAEV", which stood for "Neutron-Accelerated Escape Velocity" or "Neutron-Accelerated Extreme Voles", depending on who you ask. Since then we've been changing things up and going in our own direction, hence why the acronym was done away with. So Naev is the first and/or only free open-source game you've been working on? How exactly did working on it influence your daily routines? Do you have enough time? bobbens: Well Naev is the open source project which gets most of my dedication as project leader. However, I've also contributed patches to the UFO:AI, freedroidrpg and SDL* (as part of GsoC**). When I was still a regular undergraduate student I used to spend most of my free time working on Naev. So it greatly influinced what I did most of the time. However, now as a PhD student I no longer have as much time, so my contributions have waned a bit. BTAxis: No, as I said I was previously (and still in a very minor way) involved in UFO:AI. So Naev is my second open-source game really. But to answer the question, Naev to me is a hobby project. It's a way of exercising some creativity, in terms of thinking up ways to change the game and in terms of creating content for the game. As such, time is a non-issue; I spend time on Naev when I can and want. Deiz: Yep, first and only. It hasn't affected my daily routines too much, overall. I contribute when I have time, and the time I spend on Naev is more or less cannibalized from time I used to spend on time-sink sites like Reddit or Slashdot. Can you tell us anything about the rest of the community? Are the contributions good? Helpful? bobbens: Well the community is still quite small. It's great to see people show lots of interest though. Naev is one of these games you either hate or love. Currently we get lots of contributions from many people. Lots of people also do one-time contributions or the likes. It is great to see that sort of stuff. However, I do acknowledge that the learning curve to contribute to Naev is still too high. Which is a long-term objective to help increase the number of contributions. BTAxis: So far the Naev community has been fairly modest. There are a few regulars, some idlers, and occasionally we get a new face. Sometimes those new faces contribute, and when they do that's good for us. Overall, the contributions we do get are quite helpful, though of course we do have some standards. Some time ago there was a guy on the forums who wanted to contribute ship models, but wasn't much good at it. Through feedback and suggestions, he actually improved quite a bit, and he ended up providing great ship models, enough for two whole factions. Deiz: Oh, absolutely. It's only relatively recently that Naev has had a decent number of internal content producers.The only reason that older releases of Naev have decent-looking ships is because bobbens was able to use appropriately-licensed resources from Vega Strike. So if someone wanted to lend a hand upon reading this interview, what do you currently need the most? bobbens: First off, play the game. Lots of people come wanting to contribute before they actually get into the game. This is a good way to see what needs more work on and get a feeling of the game's atmosphere. Then one must choose what to contribute on. I recommend starting with simple missions to get a feel of the development cycle and also to have contributions that are easy to add. Currently I'd think what we need most are missions and campaigns, although we have the problem that in the pipeline we have major changes which make it so certain missions will need heavy rebalancing and adjusting. However, if we wait until the game is mature to start content development we would never get anywhere. So it's a question of just being motivated and willing to learn to dive into mission development. BTAxis: If people want to contribute graphics, audio or writing, there's information to be had on our wiki. As a general rule we can use whatever help we can get, but probably the greatest need is for more missions. As Naev is essentially a story-driven RPG, missions are the core of the game experience. There's a lot of flexibility in that area. We have a rough framework drawn up for the big factional campaigns, but I'd like to think of Naev as a platform for a lot of different storylines to coexist, without necessarily needing to form a coherent whole. A mission writer would ideally know (or be willing to learn) how to script their own missions in Lua*. We can help with that if needed. Worst case, a mission writer can just write text and ask someone else to handle the scripting part. Deiz: Specifically? I'd say sounds. We have over an hour of Naev-exclusive music, somewhere on the order of a dozen unique ships, and many, many of our own planet images... but we still only have ten or so different weapon sounds spread between around fifty weapons. In general, though, we don't make a habit of turning away contributors. More content, regardless of the type, is always appreciated. Project contributor "enigmatic" For me the Naev community has the right relation between getting things done and slacking, and I like how it pushes me to get better in blender and other dev-related things. Since Naev is cross-platform, mind telling us something about how the Linux client came to be? Was it ported, and if so why? Did it make any difference for the game in the long run? bobbens: It was originally developed on Linux by me. Which is the only operating system I have. Then when BTAxis joined I helped out a bit so that it would compile on windows (although he did the compiling), and thus we got the windows client. Then later on we got meric to do the Mac OS X client. And all sorts of distro maintainers to package Naev for their various distros. In fact the first non-Linux port was to FreeBSD I believe. In the long run it attracts many more users. The bulk of our users are Windows users. However, the contributors are more equally distributed among Linux, Windows and Mac OS X. The good thing is that the code is clean enough so there's very little coding required to do the cross-platform bit. It mainly works "out of the box"
BTAxis: Naev is a Linux game in principle. In fact, it didn't build on other platforms initially. Now we have people who maintain builds for Windows and Mac, and there was some talk of mobile devices too, though I'm not sure that's going anywhere. Back to Linux though, Naev is and will continue to be a Linux centric project. We take care to remain DFSG* compliant, because we want the game to be included in package managers. Deiz: I can't speak to the extremely early days, but Naev's been Linux-native since the first public release. bobbens has been a Linux user for years, as have I (for the distro-war folks, both of us formerly ran Debian, and now run Arch Linux). Do you have any personal presumptions about the future of gaming on Linux? Where does Naev and open-source gaming stand? 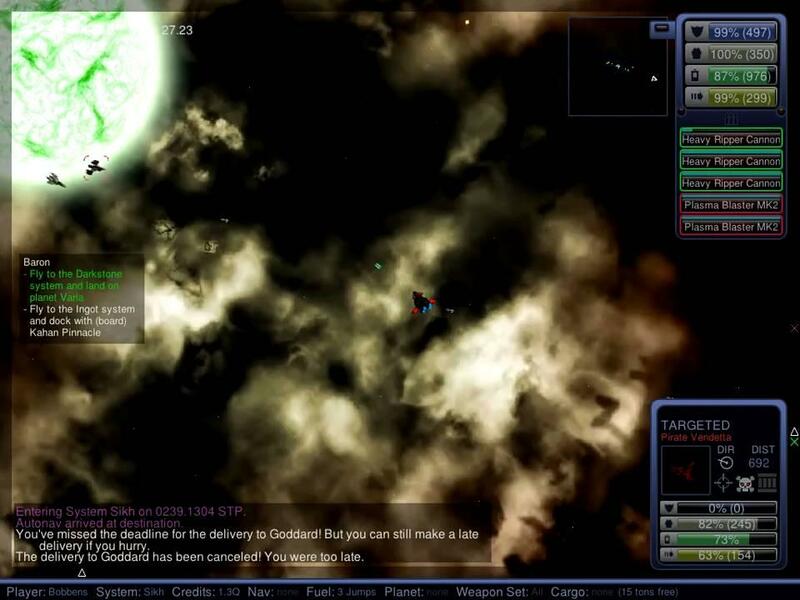 BTAxis: I think open-source gaming is an integral part of modern day Linux. The open-source crowd is traditionally composed of enthusiasts and people willing to create things, and the interest in computer entertainment is as present among them as it is among everyone else. In that sense I think gaming on Linux will continue to progress in its created-by-amateurs, spare-time-effort kind of way. Naev fits right in there, though you could argue it's a bit of a niche project because of its EV roots. It stands to get less attention than more appealing titles like freeciv and Wesnoth. BTAxis: Publicity is always nice. Deiz: I think it's looking up. Mac OS X continues to gain market share, and while it's growing into an alarming walled garden, it does still push Windows game developers to use OpenGL for cross-platform reasons.The various Humble Indie Bundles and similar promotions have also shown that Linux gamers have no qualms about paying for their games, so I think things can only get better. Okay, before we end is there anything you'd like to say to our readers? Anything at all? BTAxis: I could put a blatant recruitment pitch here, but I think I won't. Instead, I suppose all I can do is invite them to give the game a try, and if they enjoy it even a little I would consider that a good outcome. Deiz: Well, Naev occasionally has problems with contributors dropping off the face of the earth. My recurring scheme is to try and blackmail them, but I never have the necessary dirt. Maybe you could get your readers to send me compromising information about themselves? Other than that, no. And that would be a wrap. Thank you for your time! Hopefully that was as interesting to read as it was for us to write. Next Monday we'll try to host an interview with members of the already mentioned UFO: Alien Invasion team. Feel free to PM (or simply post) any questions you'd like answered as we venture further into the world of open-source gaming. Cya everybody! Thank you Bobbens, BTAxis, Deiz and all the other contributers. I started off as a delphi developer work wise (actually started on commodore 64 in the 80's for fun, then basic, then pascal, then etc). As a telecommunication's programmer, I was forced into sanity and became a C/C++ developer, talking to many telephony hardware devices, dealing with TAPI, CSTA, audio codecs, and who knows what else. Being in this game, I've done many mobile languages too, such as symbian, windows mobile, and lots of java, java especially on android, hence my nickname. I love seeing people put together a huge project, I work mostly solo as I have pride in my work, but I see many projects such as this where that rare word "passion" does create a result for all to use and enjoy! I am yet to contribute, I don't know how and don't have time really for games, but I do learn many things from open source, and I thank you for that. We all learn't to speak a language from hearing a language as babies, so wherever I see I can improve or simplify my shared stuff to help others read my code and understand, I will do so. Thanks once again for an open source game which actually works cross platform without headaches. You're a fantastic team and have put together quite a masterpiece. Thanks for sharing intellect.